The first Marion hit the streets of Indianapolis as early as 1904. Fitted with a proprietary air-cooled Reeves engine, they were basic chain-driven machines and sold in relatively high numbers, 127 finding owners at a not inconsiderable $2,000 in their first year of manufacture. Production increased, the cars becoming more conventional as the years passed. The chain drive gave way to shaft drive in 1907 and in the year that this example was produced, 1,437 cars left the works. As with so many small US manufacturers, size was a problem and the company merged to become the Handley-Marion in an attempt to get some scale of production. Sadly, the success of the bargain basement (and very effective) Model T Ford put the final nail in the coffin, the firm struggling on until its inevitable demise in 1918. The Marion Model A 30hp was amongst their most successful models and came with a rugged 3.7-litre side-valve engine and three-speed transaxle. This lovely 1911 Model A ‘Torpedo Roadster’ spent most of its life in the small town of Ossipee in New Hampshire. Its first owner was the town judge, who presented it to the local historical society in 1931. It spent many years in a museum in Camden, Maine before being exported to the UK in 1991. A file of documents dating back to 1911 is included with the car. 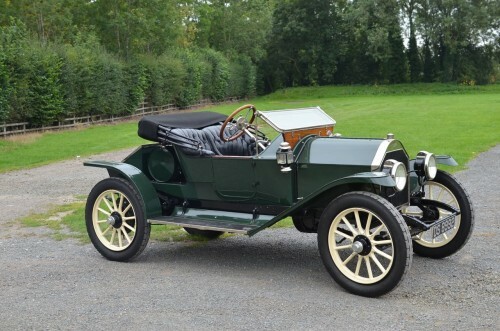 The vendor acquired the car in running but unrestored condition, using it extensively in VSCC hill climbs and driving tests, winning the coveted Edwardian Trophy in 1993 and 1994. Corrosion was starting to take hold so a complete rebuild was carried out by its professional engineer owner.The chassis was re-aligned, shot blasted and painted, along with the axles. New kingpins and bushes were installed and new bearings fitted to the hubs. All springs were reset and rebushed. The transaxle was dismantled and rebuilt with new bearings and modified to improve lubrication. The rear (and only) brakes were relined and the braking and gear changing mechanisms overhauled. The substantial five main bearing engine had new white metal throughout and a new set of timing gears, hardened valve seats and new valves and guides fitted. It was carefully balanced and the clutch relined in the correct cow-hide. A new nickel-plated radiator was fitted and the head and rear lamps converted to electric for safety and convenience. The bodywork was in excellent condition and required no metal replacement. It was stripped and beautifully coach painted along with the wheels. All other brightwork was then nickel plated. During its earlier stay in the Camden museum, the hood frame had disappeared, the vendor managing to source a new replacement from America which was duly trimmed, along with the upholstery which was recovered in best quality black hide. Since then, this stunning car has continued to be a regular in VSCC light-car events, proving extremely reliable and effective. It remains in superb condition after its nut-and-bolt rebuild, which is more than can be said of its current custodian whose advancing years have meant that he finds it a little wearing to drive over long distances! When inspecting the car, the quality of the restoration work is immediately obvious. Powerful and effective, this fine example is ready for immediate use.